When Mark originally read this story on Fox News, he knew this is something we would want to support. Childhood cancer has been something close to our hearts ever since Layla Grace put it there about 7 years ago. Just 2 weeks ago we were a sponsor of Cooks Children's Hospital The Blast here in Ft. Worth, so when we read about Bella's goal, we were determined to help her any way we could. So...I reached out to Bella and her momma to see what we could do and we are really excited to announce it today! Bella has worked really hard over the past few weeks to hand-make hundreds of bracelets for our customers. RuffleButts purchased these bracelets in your honor and will be shipping them to you FREE with your RuffleButts and/or RuggedButts order! Just be sure to use the code BELLASGIFT at checkout on the website to receive your free gift. Here at RuffleButts, we are all about raising young ladies into confident young women. Bella we are so proud of your efforts and we know our Ruffle-Mommas are too! You can follow us on facebook to learn more about our company and the things that we are most passionate about. You can also visit Peace Love Bracelets on facebook to spread the word and order additional bracelets from Bella. It's been a little while (too long) since I last posted on the RuffleBlog. While I love sharing our journey, time just gets away from me. I relate it a bit to having kids. I remember the 1st day coming home from the hospital and grandmothers literally stopping me on my out to tell me to cherish every moment, time will fly by. While I appreciated the advice, I couldn't really wrap my mind around the reality. Not only were they so right in that advice, the same warp speed world has trickled over to RuffleButts too. I don't know where the time has gone, but my "baby" is about to turn 10 this year and I have no idea how that happened! The fact that we are able to use this business to share blessings with others is not one I take for granted. It was a goal from the very beginning. I honestly struggle with how much of our "pay it forward" initiatives to share with you, our readers, as I never want goodness to come in the selfish form of "what's in it for me" or from a place of boastfulness. Although, with that said, I have also learned that sharing the joy of giving with others is inspirational in more ways than one. It truly does just that, shares joy...and then I'm totally selfish for not sharing! Ok, beyond my personal issue here, I am so happy to share a recent RuffleButts moment. One of our team members by the name of Tristan Lazor visited Haiti on a mission trip this past year. Tristan is a gentle but wise soul who inspires me daily by the foundation of her faith and commitment to others. 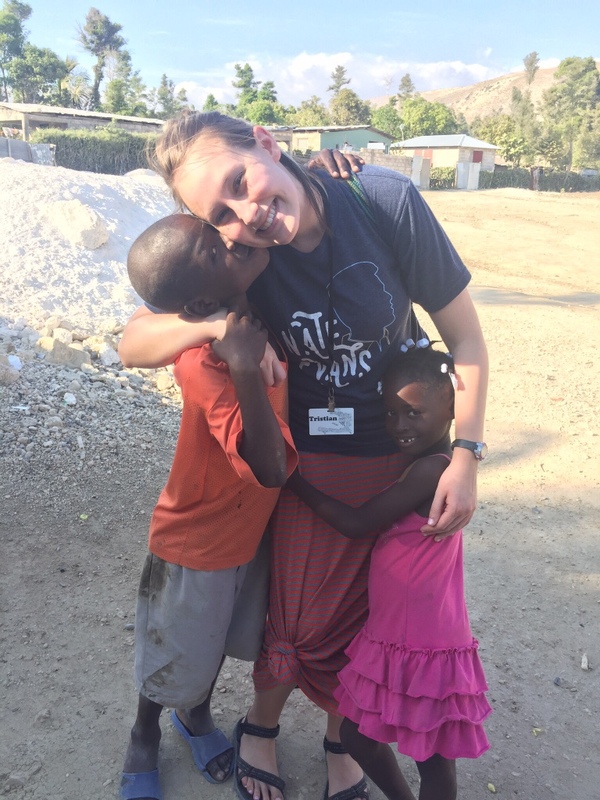 So when a sweet letter from a Haitian orphan randomly appeared in my mailbox one day, I knew just who to enlist for help with this project! Tristan pulled together the perfect RuffleButt's gift and sent it on its way down to the country that is close to her heart. We do this type of stuff fairly often around here, but once it's sent on it's way, we don't hear much about it. This time was different. We received the sweetest email from the organization and saw a link they posted to their own blog sharing the story. While we already had the simple joy of giving, their thank you made the experience beyond rewarding. Seeing a blind Haitian orphan jumping with joy in our ruffled creation..it just doesn't get much better than that! So, I'm sharing our joy with you today. Watch the video, then count your blessings. It's also a great teachable-moment tool for your kiddos. My daughter talks about Angeline and this video almost weekly. It's pretty amazing that such a simple thing could bring someone else such a big smile, especially when our kiddos take these good fortunes for granted. When I started RuffleButts, my initial motto was "spreading ruffles and sharing smiles". While we don't use that so much today (while totally genuine, it sounds a little cheesy), it is still very much ingrained in who we are. And what a beautiful smile she has!